So, I’ve been extremely stubborn about talking about being pregnant via social media, etc. I just haven’t wanted to do it. I have legitimate reasons…but part of me still thinks I’m being ridiculous. I can’t really decide. There are too many hormones and mood swings up in here. I found this survey-thing on a friends’ blog, and I liked it, and I remembered how much I looooved doing stupid Myspace surveys back in the day, and well…I JUST REALLY WANTED TO DO IT. So I thought I’d give it a try. Total weight gain: 38lbs as of my appointment last Monday! My weight gain has been super weird. Lost 5-10lbs the first trimester, stayed the same for a while, suddenly gained 12lbs in one month, normal gain the next month, and another 12lbs this past month. I see a different midwife each time I go to the hospital for a checkup, and each of them have different philosophies about if this is “healthy” or not. I like the one who told me not to worry about it because every woman is different. I didn’t like the one who lectured me about “how hard pregnancy weight is to lose” and “growing a big baby”. Maternity clothes? Ugh. I finished that dress that I posted about! I’ll put pictures up of that soon! And I bought a pair of yoga pants at Target a few weeks ago (non-maternity, but they stretch!) and I basically wear those every day of my life. A friend gave me two pairs of Gap maternity jeans (thank you, thank you!) but…even those are cutting across my belly in uncomfortable ways these days. Best moment this week? Running errands with my hubs on Saturday! Sounds silly, but…it was really fun. We went to a hardware store and bought a car seat. It’s like we’re real adults or something! Movement? YES. She is a long baby, and I’ve got a long torso that she likes to stretch out in. She likes to stretch out sideways, or shove her feet up on top of my ribs (as in, between the skin and bone) as far up as she can go, or kick my stomach. It’s a party up in there! Food cravings: Anything sweet, sugary, and bad for me. Also, carbs (which the “big baby” midwife chastised me about). Last night I made cinnamon rolls at midnight and it was awesome. Labor Signs: Not really. Pretty sure I have Braxton-Hicks a couple times a day, but that’s about it. Belly Button in or out? Out, mostly. I have a pretty intense innie…so it’s not completely popped and I’m not sure it will, haha. Wedding ring on or off? On! 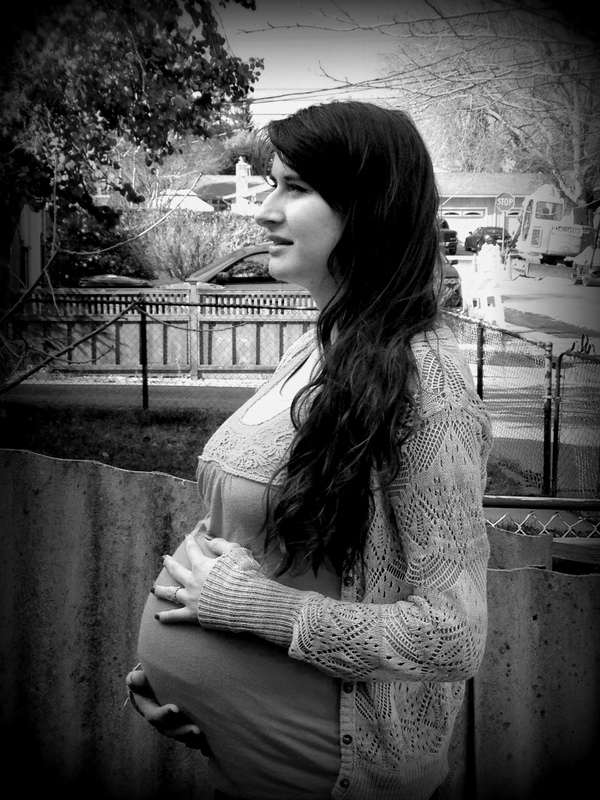 It’s been pretty loose my entire pregnancy, and just barely started to get slightly tighter the last couple days. Happy or Moody most of the time: SO. MOODY. My husband is a wonderful person for putting up with it. I’m having a really hard time being happy and positive – which is weird because I’m typically a bundle of optimism and joy. I am really hating the extra hormones and mood swings. But I am still really, really grateful that I get to be a Mom. It’s just hard to remember how much of a blessing and a miracle this whole thing is when it’s also very uncomfortable and difficult and tainted by hormonal episodes that make no sense. the most delicious pizza of all the pizzas. The hubs and I took advantage of the recent three-day weekend to visit some of our good friends that live up in Alameda. They are quite awesome and know all of the delicious restaurants up there…so we took a chance on this neat little Italian place called Tomatina’s. 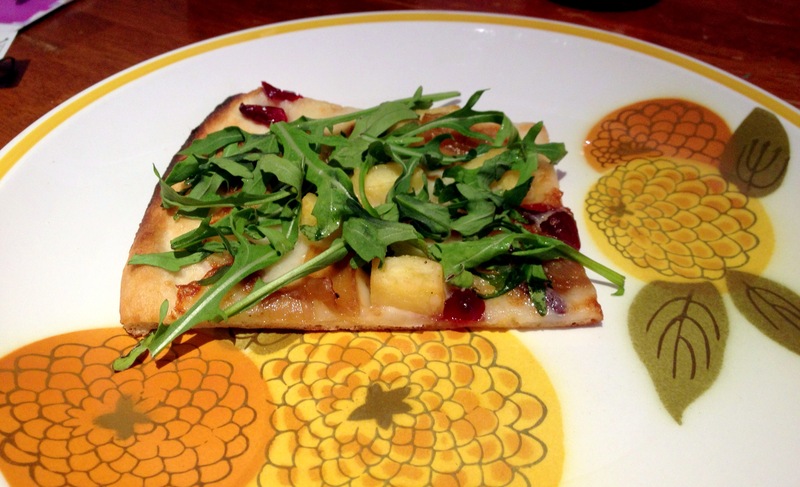 They have a special pizza this month, “Pizza Cipolla Caramellate Con Mele”. yes, that would a photo of my leftovers that I re-heated and ate for lunch the next day. And obviously instagrammed. Because that’s what it’s for…pictures of your food. Anyway. I thought a great deal about recreating it in my own kitchen (thanks to the urging of a couple dear friends of mine). When I went grocery shopping the other day and found baby Arugula on sale for less than a dollar a package, I took it as a sign. 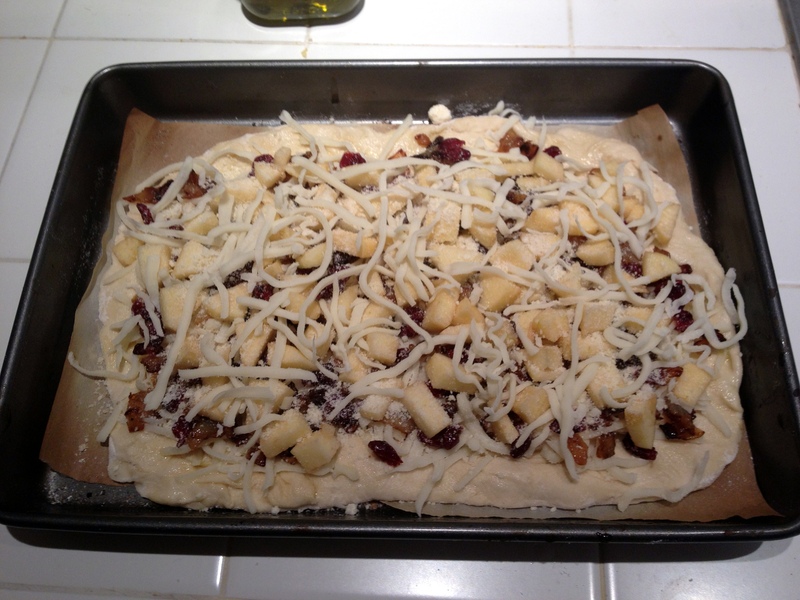 I made the full recipe, which produces enough dough for one 14″ (medium) pizza. 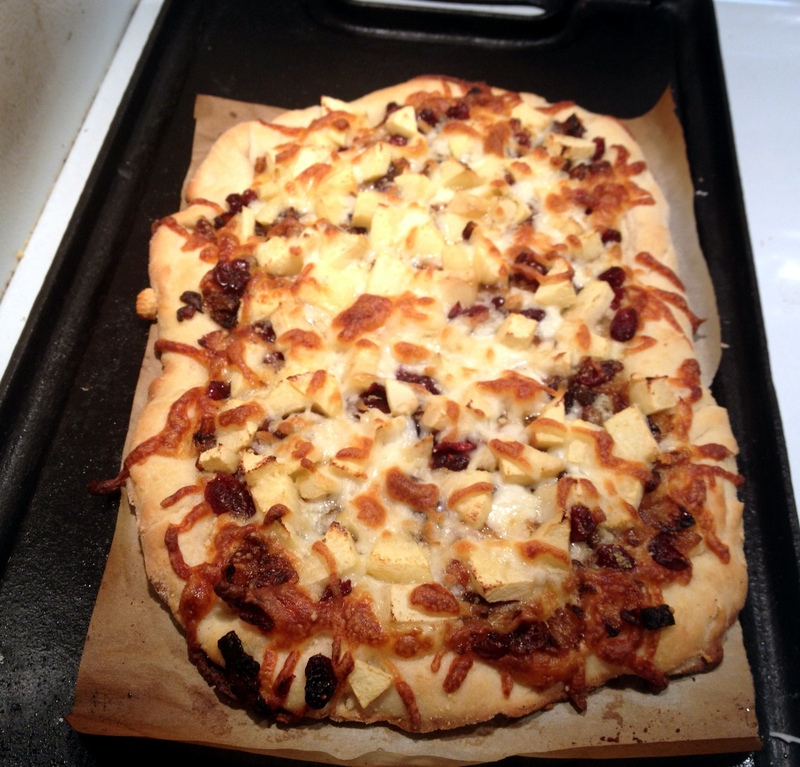 But I split the dough in half and made two 10″ pizzas (one for me, one for le husband). Here’s a short little ‘recipe’ for everything else I did! All of my super duper fancy ingredients. *these are just the measurements I used – you can adjust them to fit your personal taste! I don’t have a functional pizza stone at the moment (mine has something funky stuck to it, so it smokes and smells terrible whenever I put it in the oven…), so this is how I did it instead. quick word to the wise: I warped my pan while doing this because the oven has to be so dang hot. Haha. So, pick a pan you don’t care as much for, or use a higher oven rack, or turn the heat down to 475 or so and bake a little longer to try and avoid this. Or just get yourself a pizza/baking stone – it’s worth it. 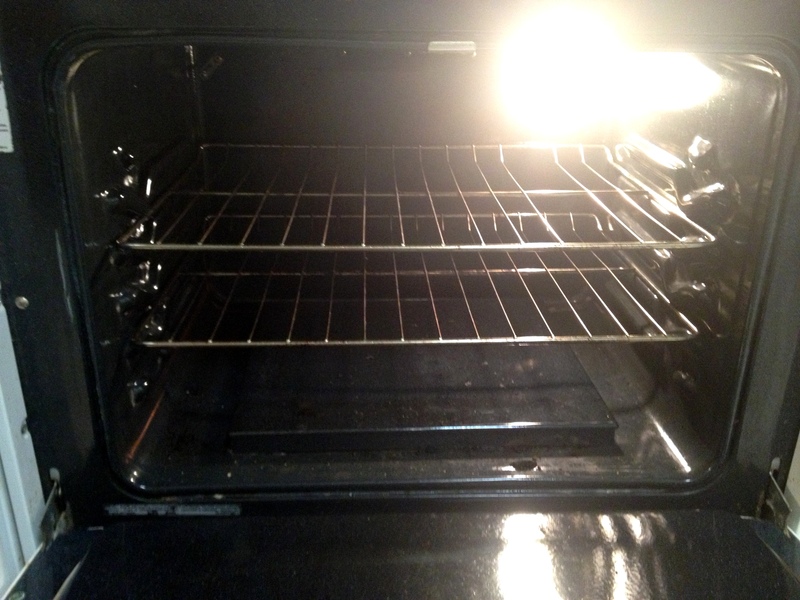 Position a rack in the lower portion of your oven, and preheat to SUPER ULTRA CRAZY HOT. Or, 500-550 degrees Fahrenheit (but not broil). That works too. Yeah, I forgot to move my oven rack before preheating, so this is what “lower portion” means in regards to me and my gas oven! 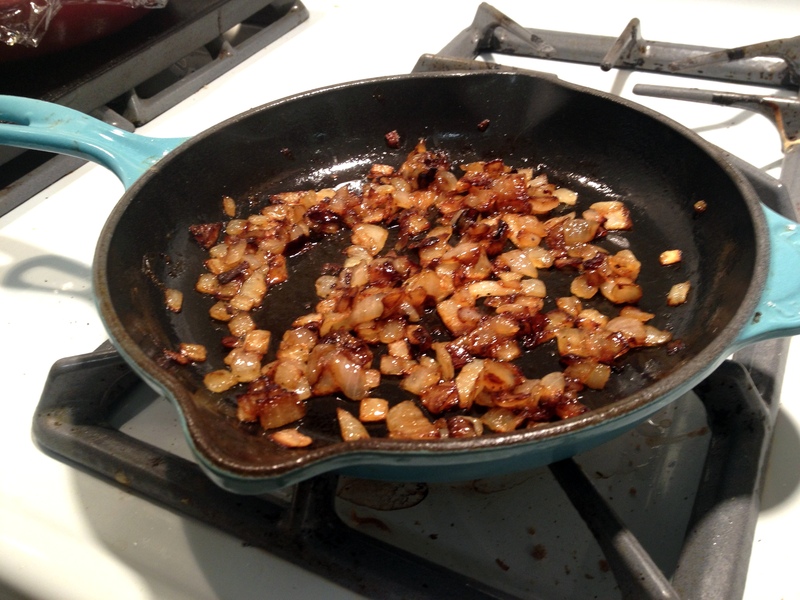 While oven is heating, caramelize yourself some onions. Thin squares. 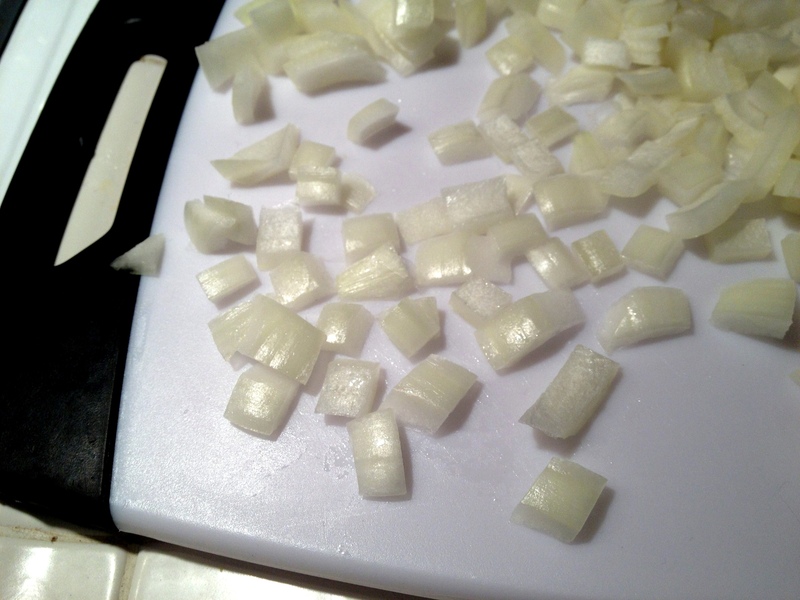 Easy, because the layers of the onion peel apart to make the “thinly sliced” thing happen automatically! Well actually, you can chop them up any old way you want. So long as they’re thin in the end : ) some people like long strips instead. 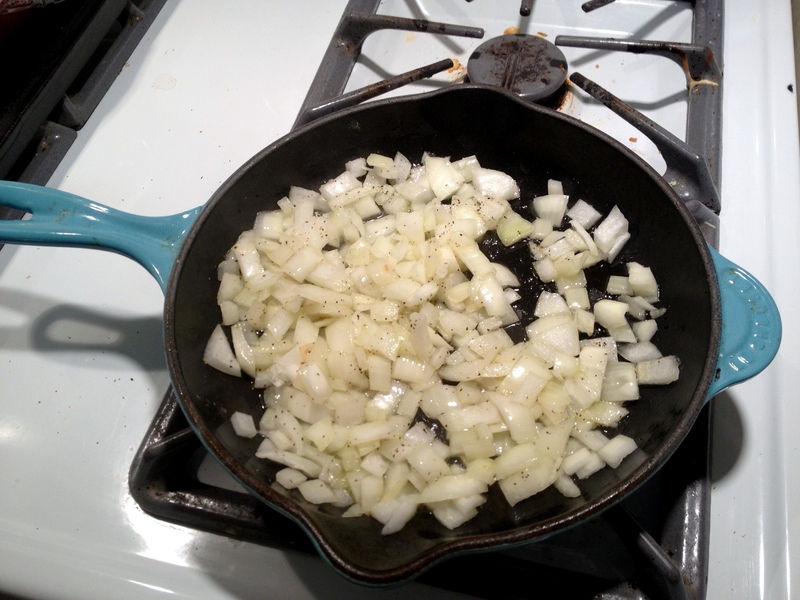 Heat 1.5 tablespoons olive oil in a skillet until it is hot, but not smoking. Add onions, 1/8t salt and a dash of pepper. 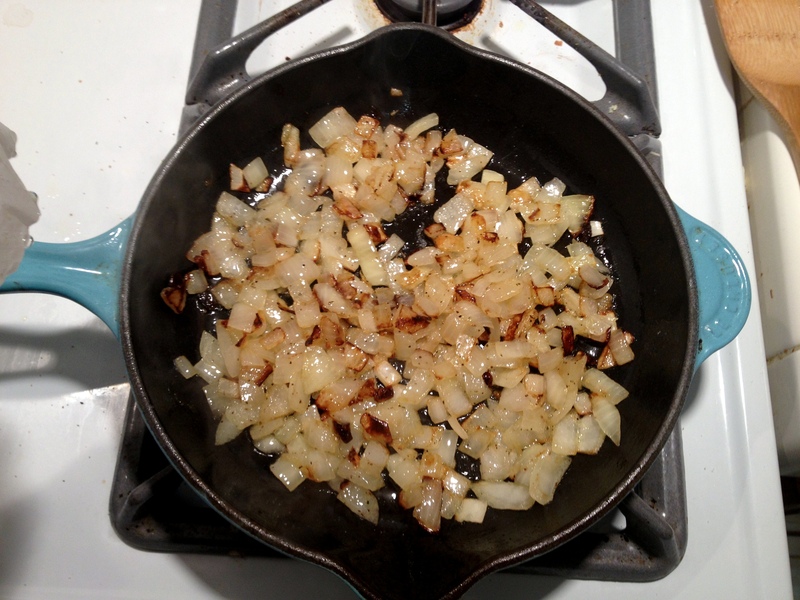 Cover directly with a parchment round and cook until onions are soft and golden brown – about 20 minutes. Stir occasionally as this is going on. Covering Directly! 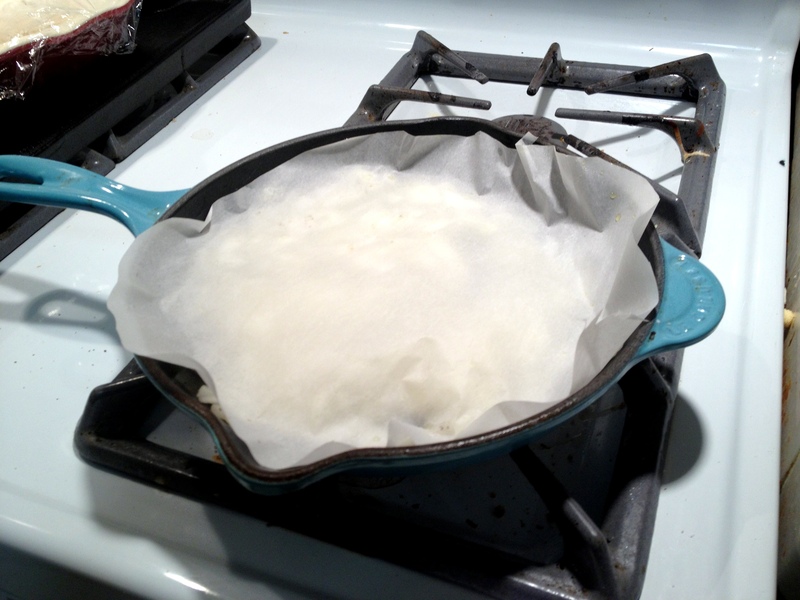 Parchment paper is breathable, so moisture is retained but not too much. This process is somewhere in between using a regular lid and leaving the pan uncovered. BAM. Caramelized. Delicious. They smell SO GOOD. Once that’s done, shape your pizza dough however your little heart desires and place atop a parchment-lined baking sheet. Brush liberally with olive oil. Sprinkle with mozzarella. 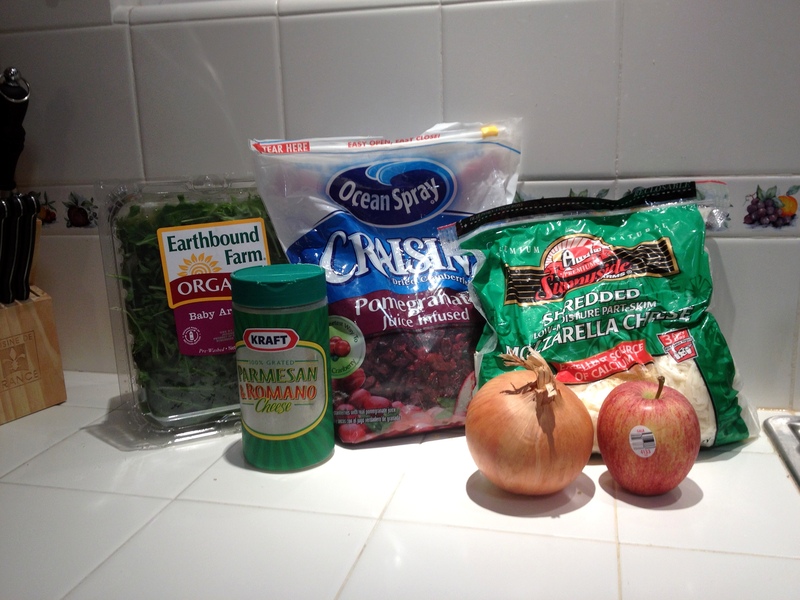 Top with onions, diced apples, and dried cranberries. Sprinkle parmesan over all toppings. 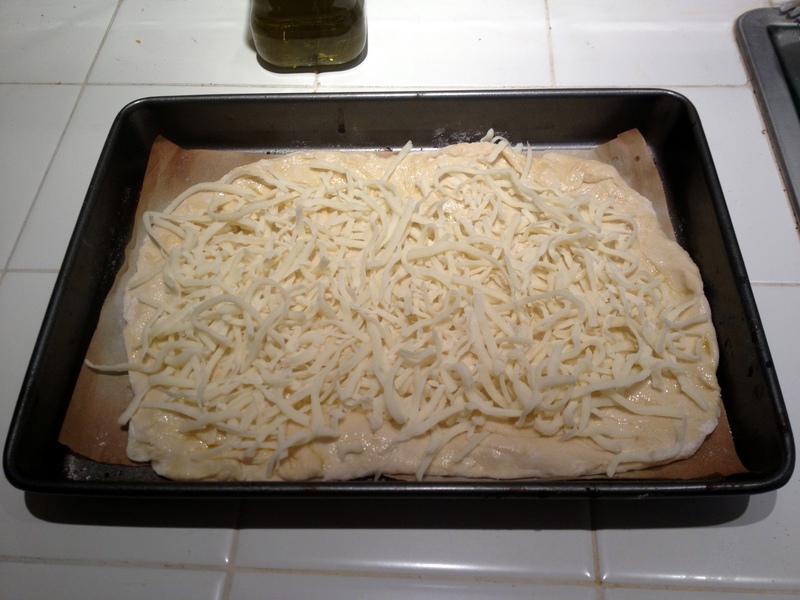 Place baking sheet on the lowest oven rack and cook about 12 minutes, or until edges of crust are golden and cheese is melted. Carefully remove from oven. 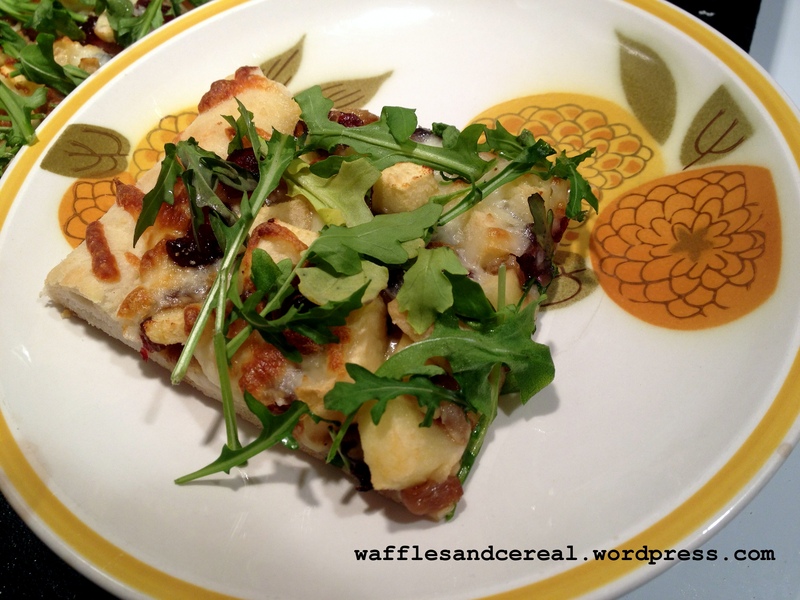 Allow to cool for a couple minutes, then top with baby arugula. Serve immediately. 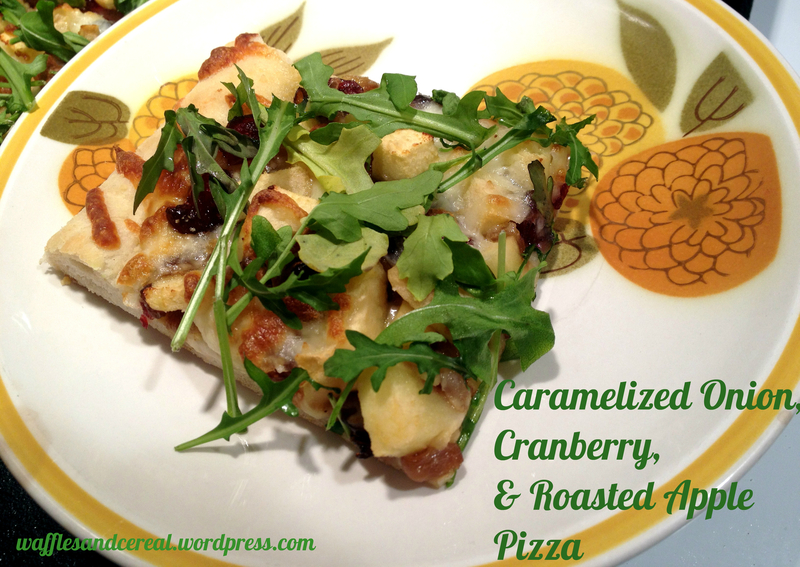 Topped with Arugula and ready to slice! TA-DA! That’s all there is to it! The toppings aren’t hard to prepare at all, and it’s super delicious (and dare I say, impressive?). 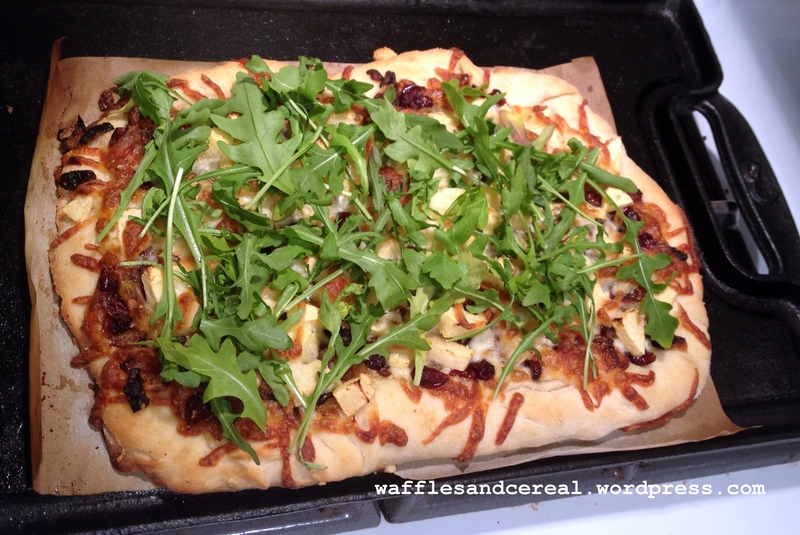 The only thing that takes up a bit of your time is the crust – unless you decide to go with store bought, which to be honest would probably still taste fabulous because this combination of toppings is so brilliant. Or, with my favorite recipe I linked to up there, you can make it to a month ahead! Just freeze it after it’s risen : ) if you’re not that forward-thinking, it can be allowed to rise in a covered, refrigerated bowl for up to one day. 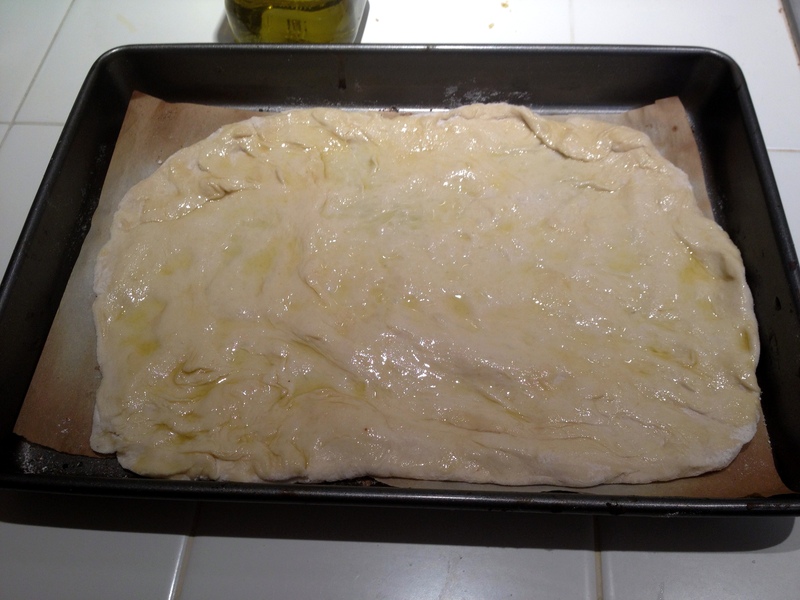 Whatever make-ahead method you choose, be sure to allow the dough to come to room temperature before shaping it! Let me know if you give it a go, or have any questions! Enjoy!